The late antique city has often been seen in negative terms: as the feeble continuation of classical urbanism, weakened by the excesses of religion and bureaucracy. However, over the last forty years, fieldwork in Africa, Greece, Turkey and the Levant has revealed flourishing monumental cities now defined by fortifications, colonnaded streets, and churches. Despite this, we still have no vision of everyday urban life to present to the wider public, in text or images. Yet the potential of late antique evidence for this topic is very great. The late antique period has been the subject of four decades of intense research and debate. However, we still have no image of urban life at this time to present to the wider public. This contrasts with other periods of classical history, which are more widely known, thanks to effective synthesis and representations in art or film. As a result, late antiquity is effectively absent from popular historical consciousness. This makes it difficult for the work of scholars working in this field to be absorbed beyond academia, despite a great deal of research being undertaken on the period. Thus, it seems timely to bring academic work on late antiquity to wider attention, to compete with ‘Roman’ and ‘Medieval’ images of the European past. To achieve this, scholars must be able to evoke the material atmosphere of late antiquity convincingly, in both text and images, to create an imaginative space in which the public can conceive of the events and cultural development of the time. The most effective way to do this is to describe the everyday urban society of the 4th-6th c., concentrating not just on its great capital of Constantinople, but rather on middling and smaller provincial cities, which are better known, in terms of both archaeology and epigraphy. By reconstructing the cities of this period in a careful scholarly manner (rather than as a market-oriented film or computer game) the work will hopefully form the basis for an inspiring and accurate evocation of the urban form and metropolitan atmosphere of the period. This would provide cultural insights not available in orientalising TV documentaries produced about ‘Byzantium’. Rather, a study of everyday life will bring the ordinary, but still unfamiliar, into greater focus, and allow the complex world centred on Constantinople to be appreciated for something apart from its ‘otherness’. An illustrated narrative of late antique urban space will permit the wider public to access the rich cultural world of late antique cities, at a personal level, gaining insight into experiences familiar to Augustine, Justinian or Mohammed. The project will seek to establish an academic basis for the reconstruction of daily life in the late antique city, and highlight the most important discoveries through selective case studies. Our project will also provide what is at present absent: a framework within which to explore key themes in everyday life such as urban social relations, laws governing market trade, or practical co-existence between different religious communities. This will also provide a context for evaluating the nature of primary data: the fragmentary material culture found on sites, behaviour attested in texts, or representations of people in late antique art. By connecting diverse sources in a spatial narrative, we will reach a better understanding of the life rhythms of city dwellers, the function of their buildings and the significance of artefacts used in daily life. For the first time, the ‘feel’ of late antique cities will be explored – via the structure, relationships and material experience of urban life. Our work will also permit a more positive evaluation of the urban tradition of the period by focusing on the prosperous cities of the Central and Eastern Mediterranean, rather than on their ‘declined’ equivalents in the North and West. The focus on ‘secular’ topography will also permit us to redress an imbalance in the over-concentration of scholarly interest in ‘Christian topography’. At the same time, our work will establish a stronger general context in which urban religious phenomena new to the period, such as Christian public processions, can be better understood. 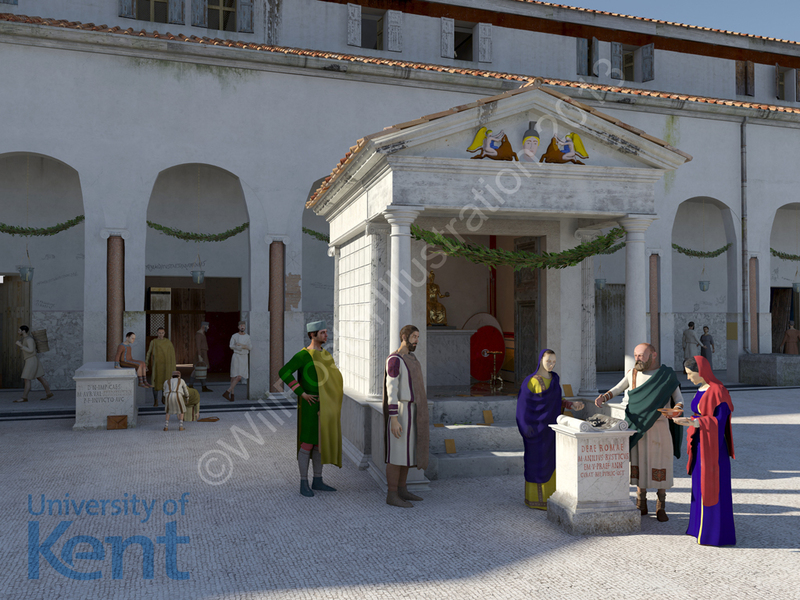 The project aims to break the concentration on Pompeii in the study of everyday life in the Roman Empire, by introducing a wide range of new source material. Our illustrations will demonstrate how the period can be represented in an engaging but critical manner, adding new textures to the historical representations of the period, by considering regional variation, temporality, seasonality and wear in dress and building decoration, and on the disrupted use of artefacts in real life.